Thieves often use Bluetooth technology to transmit card and pin information. 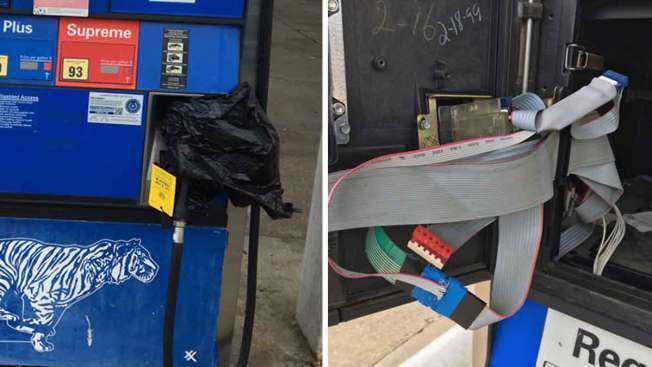 Card skimmers at gas pumps and ATMs are a growing problem, but did you know your cell phone can protect you? Texas Agriculture Commissioner Sid Miller made a video explaining a few tips to remember when filling up your gas tank. First, avoid pumps at the end of gas stations. They're often too far for the store clerk to have a clear view of the pump. Next, leave your debit card in your wallet. It's all too easy for a thief to skim your debit card's magnetic strip. If they catch your pin number, you can bet your bank account is up for grabs. Have a look around the pump. Look for tampering, a loose credit card reader or a broken seal on the pump's cabinet. The best way to check for skimmer devices is using your phone, Miller said. Thieves often use Bluetooth technology to transmit card and pin information. Just turn on Bluetooth and search for a device. If you see a long string of numbers trying to connect, that's a bad sign. 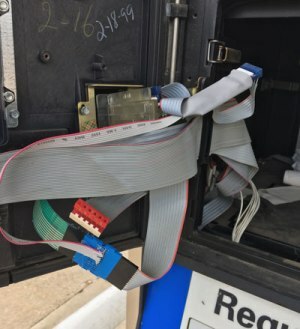 As NBC Responds in DFW reported in April, law enforcement across the U.S. have seen a spike in skimming cases this year, and it's expected to keep rising. More credit and debit cards are using chip technology, making it increasingly difficult for thieves to skim your information. Miller also noted to always print a receipt. You'll need the receipt to file a claim with the gas station's insurance in case you pump bad fuel, or if your identity is stolen. If it looks like a pump or ATM has been tampered with, move to another pump or pay inside. If you notice suspicious charges on your account, contact your financial institution immediately, the TDA said.